After months of speculation, Apple finally released some vague numbers related to the Apple Watch. As a part of their fiscal Q3 2015 earnings release, Apple announced that revenue from "Other Products" including the Apple Watch, iPod, Apple TV and other accessories totaled $2.64 billion during the quarter. This compares to roughly $1.69 billion in fiscal Q2 2015, before Apple Watch sales began. Combined with some comments from Tim Cook, this should help us get to a rough estimate of Apple Watch shipments (if not sales) for the quarter. We can then also compare this estimate with the third party data sources I highlighted in my last post. Apple's CFO Luca Maestri mentioned during the earnings call that the Apple Watch was responsible for more than 100% of the sequential revenue growth of "Other Products" because of a decline in revenues from non-Apple Watch products like the iPod, Apple TV and other accessories. If we assume a 15% sequential decline in revenue from those products, we can attribute roughly $1.2 billion in revenue to the Apple Watch. Things get trickier from here as the average selling price (ASP) of an Apple Watch heavily depend on the product mix between various models. I've assumed that the $10,000+ Apple Watch Edition comprised just 0.1% of sales. 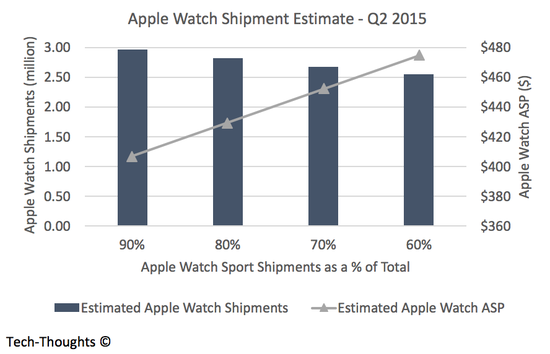 Beyond this, the share of the Apple Watch Sport (the cheapest model starting at $349) heavily influences the ASP. If the Apple Watch Sport comprised 60% of overall Apple Watch shipments, the ASP would come it at roughly $475 implying roughly 2.5 million Apple Watch shipments. But if the Sport model took 90% of shipments, the ASP would be below $410 which gives us a shipment figure just under 3 million units. All things considered, 2.5 to 3 million units seems like a reasonable estimate for shipments. But beyond missing analyst estimates (despite reports of poor sales, some analysts had expected shipments as high as 5 million), this number doesn't mean a whole lot by itself. But it does give us a frame of reference to compare next quarter's numbers and those from third parties. How does this compare to the widely criticized estimates from Slice Intelligence? Slice had estimated 2.79 million online-only sales (not shipments) through mid-June in the US. Based on Apple's numbers, it appears as though Slice actually overestimated sales by a significant margin. The only other possibility is that sales outside of the US and through retail channels were non-existent. I would normally not discount that possibility, but I have to believe that there was at least an initial burst of sales in China. But, again, the most important part of Slice's report was the trajectory of sales. Given Apple's reported figures, the initial surge of online orders and subsequent supply shortfall, it is very likely that sales tailed off after launch (with additional retail sales, the overall decline would have been lower than Slice estimated). However, Tim Cook claimed that sales in June were higher than those in April or May. At face value, this doesn't appear to match Apple's reported figures. However, this could be the result of supply ramp up after initial orders outstripped available inventory (credit to @sbono14 for the tip). Tim Cook also claimed that sell-through of the Apple Watch after 9 weeks was greater than the original iPhone and iPad. For context, iPad shipments totaled 3.27 million in fiscal Q3 2010, roughly 11 weeks after launch. We can reasonably assume that iPad shipments over a 9-week period would have totaled about 2.7-3 million, of which 2.3-2.5 million may have been sold to consumers. Given the constraint of 3 million Apple Watch shipments, 2.5 million should be a reasonable estimate for Apple Watch sell-through. Admittedly, this is more of a "guesstimate", but that's all we have to work with at this point. If we assume that Slice's pre-order estimates were right (they were consistent with estimates from other analysts), the Apple Watch sold roughly 1.5 million units at launch and roughly 1 million units since then. Of course, this 1.5 million figure refers to online orders and early supply constraints would have ensured that shipments (and revenue recognition or reported "sales") remained below this figure. Even if that pre-order estimate is off, I seriously doubt it would have been below 1 million units (the supply bottlenecks wouldn't make sense if this was lower), which would give us an estimate of roughly 1.5 million sales for the remainder of the quarter. To summarize, it appears that Apple shipped 2.5-3 million Apple Watches into the channel and roughly 2.5 million may have been sold to consumers. Of these, roughly 1-1.5 million were sold at launch to loyal Apple users and another 1-1.5 million units may have been sold for the remainder of the quarter. 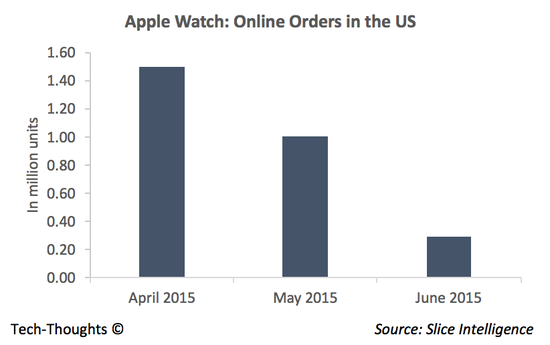 This slowdown suggests that word-of-mouth for the Apple Watch has been less than stellar. It is possible that native apps could change this. But given the constraint-benefit trade-off on smartwatch platforms, app development may not be as much of a home run as it seems.